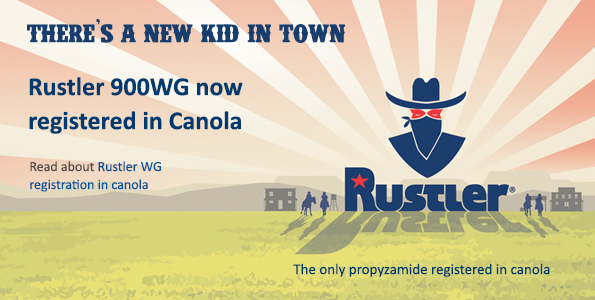 Rustler® WG now registered in canola in Australia. Rustler® WG is expected to receive registration in canola at the end of April 2015. “A key factor for achieving the best results with Rustler WG is to target germinating grasses and weeds” said Cameron. He said it is best to apply Rustler to a firm, clod-free seedbed in a non-till system, or with minimum soil disturbance, prior to planting. “For maximum efficacy apply Rustler to moist soil and when soil temperatures are low” said Cameron. For more information on Rustler WG contact your local Cheminova sales representative. © 2017 FMC Australia. All rights reserved.